As summer approaches its close, sports fans look ahead to what may arguably be the most exciting season of all: fall sports season. Whether you’ll be following the Patriots, Packers or Seahawks, or watching the World Series instead, if there’s one thing all sports fans can agree upon, it’s the need for an exceptional viewing space. As you prepare for weekend game days, you’ll want to ensure your space sets the right tone. We know that a comfortable recliner and widescreen TV are staples of any sports viewing area, but for those interested in affording their viewing space a truly distinct look, consider the following unique sports-themed decorations. Put a twist on traditional overhead lighting by incorporating neon logos of your favorite sports team or adult beverage. 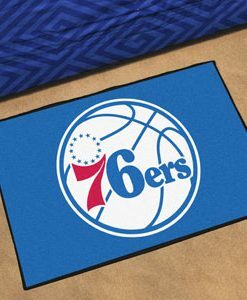 Whether a classic throwback to the bars of your youth or a tribute to your favorite championship team, an illuminated sign that hangs on the wall of your viewing space will instantly contribute a splash of personality and originality. Commemorate all the times you’ve watched games live at the stadium, arena or ballpark with framed collages of your old tickets, pennants, rosters and more. This decoration option won’t cost you a dime and will give your space a far more personal and sentimental atmosphere. Plus, there’s no reason to keep these memories hidden away in storage where they can’t be fully appreciated. For the DIY-minded, add a personal touch to your couches and recliners with pillows covered with the jerseys of your favorite sports players. First, acquire some inexpensive pillows from a local thrift or big box store and decide which jerseys you’ll be using. Then, stuff the pillow inside the jersey and use adhesive tape to secure the jersey in place at the top. Next, cut away excess jersey material at the bottom and use adhesive tape again to seal the bottom. It’s as simple as that—no sewing required! Find step-by-step instructions in this featured tutorial. Follow your favorite team all the way to the championship game this season with your own score board, where you can track your team’s wins, losses, scores and even the performance of your favorite players throughout the season. Hang a miniature chalk board or white board on a wall in your viewing area and, if you’re feeling particularly creative, make a border out of miniature baseball bats or whatever sports-related decorations you can find for cheap. For a little competition, your sports score board can also be a place to track the performance of your favorite team against that of your friends. 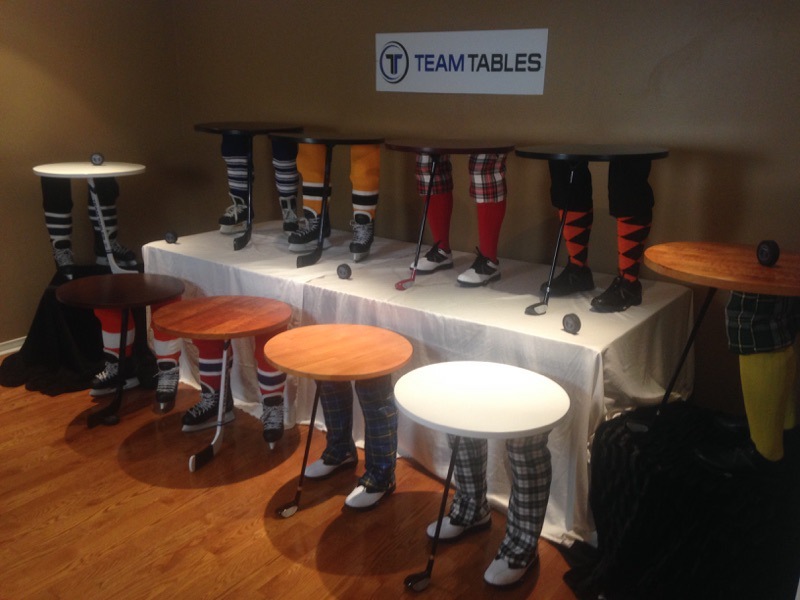 Manufactured by Team Tables and made of authentic sporting equipment, team tables will offer your viewing space a one-of-a-kind look that combines both practicality and an appreciation for authentic sports memorabilia. 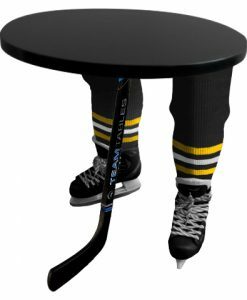 Crafted with real sports equipment, including actual skates, socks, clubs, hockey sticks and more (as seen below), these tables are also made to order with customizable features, which means you can find the table that fits your space to a tee. How will you make your sports viewing area unique this season? Looks like a perfect present for sport loving person or great decoration for sport party or evening.